Just to begin with, the Kramer line of guitars were the first commercially created guitars that Eddie Van Halen managed to sell, promote and use as his own guitars. It meant that, from this point onwards, Eddie was able to use something other than his Frankenstrat for those purposes. 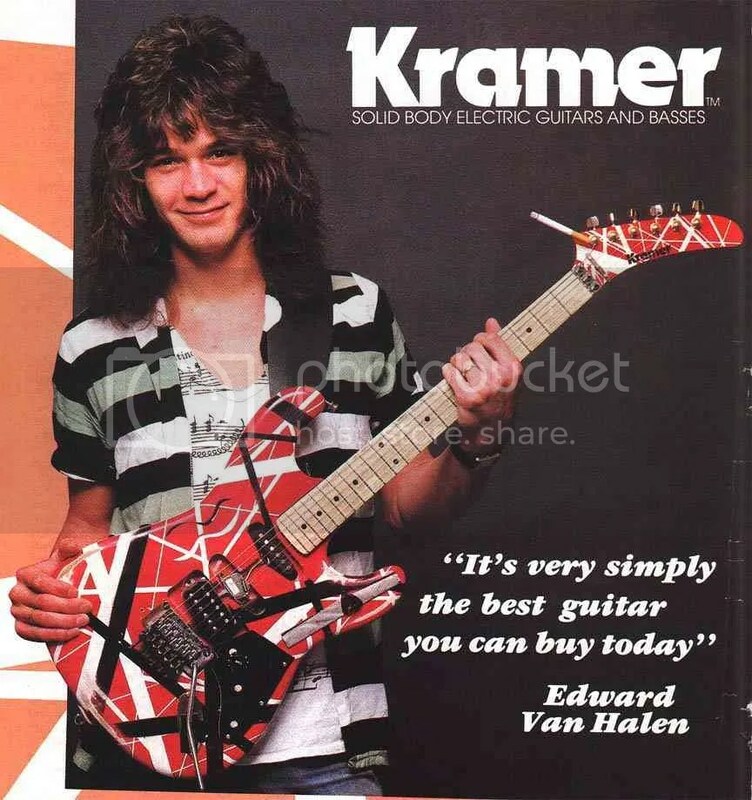 Eddie Van Halen launched his guitar brand with Kramer. Nonetheless, although not specifically created for a selling purpose, the Kramer 5150 is the baby of Eddie Van Halen’s partnership and innovation that got him started in the commercial rock world. The story goes that Eddie Van Halen met the executive of Kramer Guitars Dennis Berardi in 1981 who began communicating with Eddie on a regular basis from that point onwards. Initially the conversations were only limited to the use of the company’s Rockinger tremolo system, which Eddie was not all that keen on as he was somewhat satisfied with the Floyd Rose tremolo system and as time went on, this did not become the main focus. Eddie was obviously sick of the copycats out there trying to undo him by cloning his Frankenstrat guitar, and needed a company that could support him in his musical journey. The relationship between Eddie Van Halen and Dennis Berardi was crucial in lifting both men’s careers to new heights. Initially Eddie desired to have a model exactly like the Frankenstrat he had been using for years by that point. This was rejected by Kramer as it would have not, in their eyes, have been doable. Instead, a deal was signed in 1983 and Eddie Van Halen sponsored a great deal of models of Kramer guitars from that point onwards. Eddie Van Halen is pictured below with a Frankenstrat replica. The original idea was to specifically market that guitar, before Ed constructed the 5150. The deal with Kramer and EVH came as no surprise in retrospect. Eddie was already putting Kramer necks on his guitars, such as the Frankenstrat. The company, was (and is) seen as makers of perfect “shredding” machines, indeed an image that Eddie would have seen to be happy with himself. This particular guitar was not a Baretta unlike many people think it is. The Kramer 5150 was actually built by Edward himself in Kramer’s factory in New Jersey, using different parts that he desired to do so, loosely based on the Kramer Pacer. The Baretta came later, and was heavily based on this guitar, but the Kramer 5150 came first. What makes this guitar special, quite apart from the fact that Eddie Van Halen used it for recording purposes and playing on stage, is that there is nothing like it out there today. Everything about this guitar, from the unusual body to the wonderful sound, meant that Van Halen fans were in awe by this guitar for many years to come. Control Setup: Volume. No Pickup selector. Eddie really loved this guitar, even after his relationship with Kramer ceased in 1991. Although he stopped using it as his primary guitar once this occurred, he did give Kramer a compliment: on his Ernie Ball Music Man guitar the guitar neck was electronically mapped to be exactly the same as the one on his Kramer 5150. Additionally according to sources, the headstock was broken around the 5th tuner shortly after the guitar was last used on a recording, the For Unlawful Carnal Knowledge song “Judgement Day”. Eddie asked Ernie Ball’s Music Man department to fix the guitar for him, and they did him proud. Kramer are still going strong today, although EVH has ceased the working relationship for some time now. In short for several years, Kramer and Eddie had a strong relationship that worked well until problems arose. The fact that Eddie combined his ingenious designs with Kramer’s entreprenuership meant that, for the first time ever, Eddie had a marketable guitar. And a great one at that. Additionally, you may want to watch the video located at https://www.youtube.com/watch?v=BCdGFkj_vi4#t=408 for more information on the specifications of the guitar. The Kramer Baretta is the closest thing to owning a Kramer 5150 that you can purchase today. Still, for an transition between the Frankenstrat and the Kramer 5150, you ought to seek out either a Kramer Pacer Classic or a Kramer Pacer Vintage, sold at http://www.kramerguitars.com Still, it is entirely up to you what choice you make in recreating the classic Kramer sound. This entry was posted in Guitar, Music, Rock, Technology, Van Halen and tagged 5150, Eddie Van Halen, Electric Guitar, Kramer on July 23, 2015 by chrisairey01. On the subject of the “Judgement Day” recording, there’s a part after the guitar solo where you hear Sammy say. “is everything alright”, I think that’s where the headstock broke, or at least when Sammy noticed it. I’ll say this for locking nuts, they really do help in this situation. Had that happen to my Kramer Focus 3000, held tune the rest of the day till I could fix it. I havan early Kramer proto Bumble Bee that I got from a guy at Kramer many years ago..guys name was paul v….cant remember.its a sweet guitar.